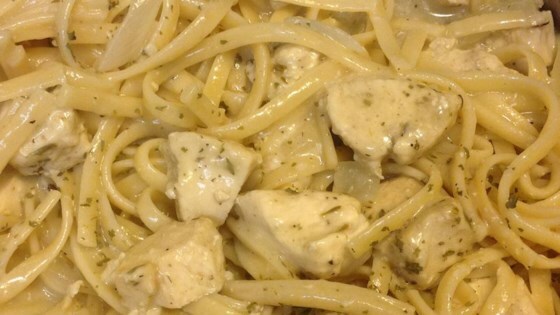 "A slow-cooked sauce with onion, chicken, and fresh herbs over whole wheat linguini." Bring a large pot of lightly-salted water to a boil. Cook the linguine in the boiling water until tender but still firm to the bite, about 11 minutes. Drain, reserving about 3/4 cup of the pasta water. Place the drained pasta in a large bowl. Melt the butter with the olive oil in a large skillet over low heat. Cook the diced onion and white parts of the green onion in the butter and oil for about 10 minutes. Stir the green parts of the green onions, the chicken, thyme, and garlic into the onions and continue cooking until the onions are translucent and the chicken is no longer pink in the center, about 10 minutes more. Stir the reserved pasta water into the mixture and remove from the heat. Season with salt and pepper. Pour the mixture over the drained pasta and toss to coat. Sprinkle the Parmesan cheese over the pasta and stir. Really good! I'll make again; tweaked it with red pepper flakes and black pepper for heat. GREAT use for whole wheat noodles. delicious, the parmesan really goes well with the sweet onions. Can't wait to make it again! Wow! this is really good...I will make this often because of it's simplicity and it's great flavor.